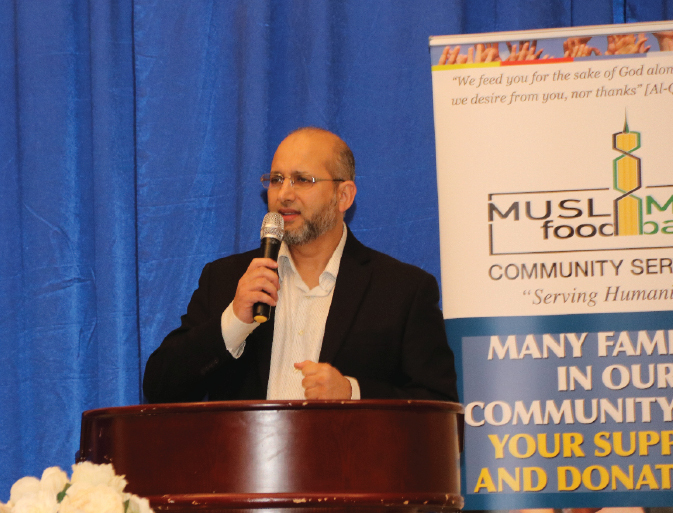 On Friday October 26th, the Muslim Food Bank and Community Services held a dinner to raise funds for the purchase of a new warehouse. A lively night featuring several speakers as well as a silent auction, the fundraiser was a success. The event was held at the Royal King Palace in Surrey, and focused on the many different programs offered by the MFBCS, and the importance of having a permanent new home for the organization to continue to grow. The event highlighted how MFBCS has grown and evolved. From its humble beginnings as a food hamper distribution service that was run out of a team member’s garage, the organization now ensures that 600 families are assisted with food items monthly through its food bank arm, and serves many more through the programming provided through its community services arm, ASPIRE. Whether it’s through youth programming, case workers, job and language support, addictions help, or mental health support – MFBCS is constantly responding to the needs of the community, making it a unique organization that focuses on empowering and capacity building in all of its clients. MFBCS is now beginning a new chapter in the organization’s history – that of a permanent new home. The new warehouse will be located at 12925 115 Ave in Surrey, in a new commercial space. Attendees at the fundraiser viewed mock ups and architectural drawings of the space, which showed how the warehouse will be used for both the food bank and community programming. Importantly, this new location will have the space to ensure that clients of MFBCS will now have a permanent space to go to- whether while waiting to receive their food hampers, or meeting with caseworkers to help move their lives forward. The fundraising dinner also highlighted how important it is for the larger community to support this organization, whether through volunteering or donations. The organization is mainly volunteer run, and the event showcased how every volunteer’s unique skills and talents are needed in such an expansive and community focused organization. Whether you have a communications background, you’re interested in project management, counselling is your forte, or you just want to make food hampers on a Saturday morning, the organization has a need for volunteers passionate to help in any way. On Friday night, through generous donations and support, over $120,000 was raised for the purchase of the warehouse. While this is an incredible start, further funds are needed to ensure that this organization can purchase the warehouse. To learn more about MFBCS and to donate, please visit www.muslimfoodbank.com.